This tank came about due to complaints from Russian tank commanders that the simple little periscope they had for target acquisition just did not give sufficient view of the battlefield. While they had experimented with T-34s with a commander's station and five man crew, this had proven too cramped in the T-34's small "gayka" (hex nut) turret. But eventually the concept of a cupola proved sound, and it was introduced to T-34 production. Replacing the left-hand commander's hatch, the commander received a cupola with five vision slits backed by triplex glass, and it was a big improvement even with the one major drawback that the commander was still the gunner. Numbers vary, but it appears as many as 5,000 tanks were built with this cupola arrangement on all types of the "gayka" turret including the pressed steel version. The kit comes with the same parts breakdown as other DML T-34 kits. This time it comes with the mid 1942 onward modified "steel" road wheels with two sets of rubber tired cast ribbed wheels and six internally buffered steel wheels; they are the correct "rimmed opening" ones for non-Stalingrad produced steel wheels as well. As is now normal these wheels are molded in one piece for a two-wheel set; the openings will need drilling out for accuracy. "Waffle" tracks are provided in DML's DS plastic. The hull comes with optional rear grilles, either solid styrene or open with an etched brass grille and an etched brass set of louvers to go under it; the Mk 1 eyeball says to be careful as it may interfere with mounting the grille. At least it is bored so the alignment pins in the engine grille will pass through it for solid attachment. A sprue of Soviet external details is included, and these are a different set from the ones which came with the Model 1942 and early Model 1942 kits. It includes two logs, two tarps, two "angle" fuel tanks for the rear of the hull, a ZIP (spares) box and two shovels. 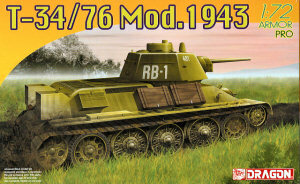 Decals and paint schemes are provided for four examples: Unidentified unit, 1st Ukranina Front, Poland 1944 (4BO green overall); 169th Tank Brigade, 16th Tank Corps, Ukraine 1943 (4BO green with whitewash patches over it); the usual "captured" T-34 in tricolor camouflage with oversize crosses, Eastern Front 1943; and Unidentified unit, Eastern front 1942-43 (named "Marshal Chombalsan - Revolutionary Mongolia" in red over whitewashed 4BO green; actually this is the 112th Red Banner Tank Brigade, later 44th Guards Tank Brigade, commanded by Marshal Choybalsan. Close.) A neatly done Cartograf sheet is provided with these markings. Overall, another one joins the fold!